A captivating presence both on and offstage, critically acclaimed American pianist Lara Downes is recognized as one of the most exciting and communicative classical artists of her generation. Called "a delightful artist with a unique blend of musicianship and showmanship" by NPR and praised by the Washington Post for her stunning performances "rendered with drama and nuance", Lara presents the piano repertoire - from iconic favorites to newly commissioned works - in new ways that bridge musical tastes, genres and audiences. Since making concert debuts at Queen Elizabeth Hall London, the Vienna Konzerthaus and the Salle Gaveau Paris, Downes has won over audiences at Carnegie Hall, Kennedy Center, Lincoln Center, the American Academy Rome, San Francisco Performances, the Montreal Chamber Music Festival, Portland Piano International and the University of Washington World Series, among many others. Her original solo performance projects have received support from prominent organizations such as the National Endowment for the Arts, the Barlow Endowment for Music Composition, the Center for Cultural Innovation and American Public Media. Ms. Downes' chamber music appearances include collaborations with noted soloists and ensembles including cellist Zuill Bailey, violinist Rachel Barton Pine, jazz pianist Dan Tepfer, and the Alexander String Quartet. Commissions and premieres of new works for Lara have come from composers Mohammed Fairouz, David Sanford, Benny Golson, and Eve Beglarian, among others. Lara's solo recordings have met with tremendous critical and popular acclaim. Her debut CD, Invitation to the Dance (2000), was called "magical" by NPR, and her second release, American Ballads (2001), was ranked by Amazon among the best recordings of American concert music ever made. Dream of Me (2006), was praised for "exquisite sensitivity" by American Record Guide. 13 Ways of Looking at the Goldberg (2011) was called "addicting" by the Huffington Post, and "magnificent and different" by Sequenza 21. Her chart-topping new release, Exiles' Café (2013), featured as CD of the Week by radio stations from WQXR New York to KDFC San Francisco, was called "ravishing" by Fanfare Magazine. 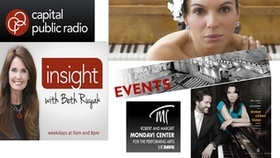 She is regularly heard nationwide on radio programs including NPR Performance Today, WNYC New Sounds, WFMT Impromptu, TPR Classical Spotlight and WWFM Cadenza. Lara's busy performance career is strongly driven by her commitment to expanding and developing new audiences for the arts. She is the Founder and President of the 88 KEYS® Foundation, a non-profit organization that fosters opportunities for music experiences and learning in America's public schools, and she regularly works and performs with the next generation of talented young musicians as Artistic Director of the Young Artists program at the Mondavi Center for the Performing Arts, UC Davis, where she serves as Artist in Residence. Lara is Founder and Director of The Artist Sessions, San Francisco. Lara Downes is a Steinway Artist. 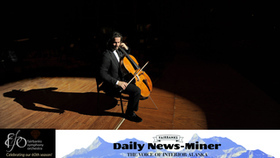 ZUILL BAILEY is widely considered one of the premiere cellists in the world. His rare combination of celebrated artistry, technical wizardry, and engaging personality, have secured his place as one of the most sought after and active cellists today. A consummate concerto soloist, Mr. Bailey performs with the symphony orchestras of Los Angeles, Chicago, San Francisco, Indianapolis, Dallas, Louisville, Honolulu, Milwaukee, Nashville, Toronto, Minnesota, Utah, Israel, and the Bruchner Orchestra in Linz, Austria. He has collaborated with such conductors as Itzhak Perlman, Alan Gilbert, Andrew Litton, James DePriest and Stanislav Skrowaczewski and has been featured with musical luminaries Leon Fleisher, Jaime Laredo, the Juilliard String Quartet, Lynn Harrell and Janos Starker. Mr. Bailey has appeared at Disney Hall, the Kennedy Center, the United Nations, Alice Tully Hall, the 92nd St. Y and Carnegie Hall, where he made his debut performing the U.S. premiere of Miklos Theodorakis' "Rhapsody for Cello and Orchestra." In addition, he made his New York recital debut in a sold out performance of the complete Beethoven Cello Sonatas at the Metropolitan Museum of Art. World Premiere of the Doug Varrone Dance Company's performance of "Victorious." Zuill Bailey is an exclusive recording artist on Telarc International. His "Bach Cello Suites" CD immediately soared to the Number One spot on the Classical Billboard Charts. Zuill Bailey's critically acclaimed recordings include his highly anticipated "Britten Cello Symphony/Sonata" CD, live performances of the Dvorak and Elgar Cello Concertos, with the Indianapolis Symphony Orchestra, "Brahms" complete works for cello and piano with pianist Awadagin Pratt, and "Russian Masterpieces" showcasing the works of Tchaikovsky and Shostakovich performed with the San Francisco Ballet Orchestra. Other releases include his innovative "Spanish Masters" CD for Zenph Studios, where he forms a unique duo blending with recordings of composer Manuel de Falla. His discography also includes a debut recital disc for Delos, Cello Quintets of Boccherini and Schubert with Janos Starker, Saint-Saen's Cello Concertos No. 1 and 2 "Live," and the Korngold Cello Concerto with Kaspar Richter and the Bruckner Orchestra Linz for ASV. Zuill Bailey was awarded the Classical Recording Foundation Award for 2006 and 2007 for Beethoven's complete works for Cello and Piano. The highly touted two disc set with pianist Simone Dinnerstein was released on Telarc worldwide. In celebration of his recordings and appearances, Kalmus Music Masters is releasing "Zuill Bailey Performance Editions," which encompasses the core repertoire of cello literature. Network television appearances include a recurring role on the HBO series "Oz," NBC's "Homicide," A&E, NHK TV in Japan, a live broadcast and DVD release of the Beethoven Triple Concerto performed in Tel Aviv with Itzhak Perlman conducting the Israel Philharmonic, and a performance with the National Symphony Orchestra of Mexico City. Mr. Bailey collaborated in the televised production of the Cuban premiere of Victor Herbert's Cello Concerto No. 2 with the National Orchestra of Cuba. He has been heard on NPR's "Morning Edition," "Tiny Desk Concert," "Performance Today," "Saint Paul Sunday," BBC's "In Tune," XM Radio's "Live from Studio II," Sirius Satellite Radio's "Virtuoso Voices," the KDFC Concert Series, Minnesota Public Radio, WFMT and RTHK Radio Hong Kong. Mr. Bailey received his Bachelor's and Master's Degrees from the Peabody Conservatory and the Juilliard School. His primary teachers include Loran Stephenson, Stephen Kates and Joel Krosnick. Mr. Bailey performs on a 1693 Matteo Gofriller Cello, formerly owned by Mischa Schneider of the Budapest String Quartet. 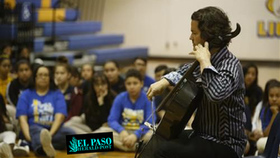 In addition to his extensive touring engagements, he is the Artistic Director of El Paso Pro-Musica (Texas), Artistic Director of the Sitka Summer Music Festival and Series, (Alaska), the Northwest Bach Festival ( Washington), and Professor of Cello at the University of Texas at El Paso. For Steinway & Sons, two of America's leading instrumentalists channel Bernstein, Barber, Copland and Foss to "rediscover the musical adventures of those days, quests that swept along a marvelling American public" Pianist Lara Downes and cellist Zuill Bailey have each, in their own way and quite often together, been credited with seeking out new ways of presenting classical music, of reinventing the art of the recital for our time. But for both of them, the tireless quest to touch audiences through reawakening their musical curiosity owes everything to the pioneering spirit of earlier American composers. To Samuel Barber, Aaron Copland, Lukas Foss and articulated most charismatically by Leonard Bernstein. 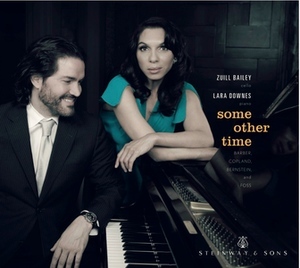 Their new album, "Some Other Time", released by Steinway & Sons on April 29th, 2014, takes its title from a number in Bernstein's musical On The Town. It's a number about moving on, about remembering a great adventure, but with the promise that it will all come together another day, another time. 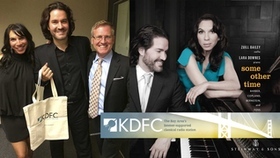 Each week KDFC - San Francisco eNotes members can download a free mp3 from some of the biggest releases in the world of Classical music, only at KDFC.com. 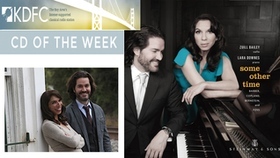 This week is Pianist Lara Downes and cellist Zuill Bailey. The du admits to a nostalgia for that period in American music when families gathered around their radios to hear the Saturday broadcasts from the Metropolitan Opera and around their TV sets to watch Leonard Bernstein's Young Peoples' Concerts. "It's not a world we grew up in, but it's a world we dearly want to see. ", says Downes. This new collection of transcriptions and concert pieces is a reflection of that "golden generation" with selections by Leonard Bernstein, Lukas Foss, Aaron Copland, and Samuel Barber. The CD title, "Some Other Time", refers to the wistful tune from Bernstein's On the Town which opens the disc. Download a free mp3 of Lara Downes and Zuill Bailey performing Leonard Bernstein's "Dream with Me"
The CD 'Some Other Time' by pianist Lara Downes and cellist Zuill Bailey brings together music by a closely-knit group of American composers from the 20th Century: Samuel Barber, Leonard Bernstein, Lukas Foss, and Aaron Copland. 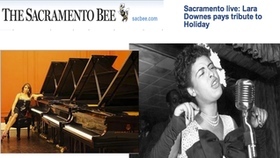 Downes says she first played with Bailey in a concert commemorating Barber's centennial, and in the years since, he has become her best musical friend. 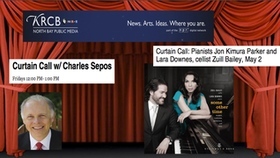 Tune in to KRCB - Rohnert Park CA TODAY - Friday May 2nd at noon PT for Curtain Call with host Charles Sepos and his chat with 2 extraordinary musicians - cellist Zuill Bailey and pianist Lara Downes. 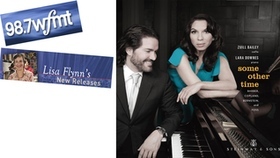 The duo will talk about their brand new CD Some Other Time, on the Steinway & Sons label. Two musicians, with distinct artistic lives, each known for character and integrity, come together in Some Other Time, a collection of American music from iconic composers, including Leonard Bernstein, Samuel Barber, Lukas Foss, and Aaron Copland. Cellist Zuill Bailey plays on an instrument made in 1693 by Matteo Grofiller. His collaborator in this recording, pianist Lara Downes, used an instrument of much more recent vintage in the form of a Steinway piano made in New York. 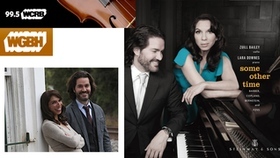 Hear cellist Zuill Bailey and pianist Lara Downes in a recording inspired by friendship, adventure, and nostalgia, including music by Bernstein, Copland, Barber, and Foss. The disc is WCRB-Boston: CD Of the Week. 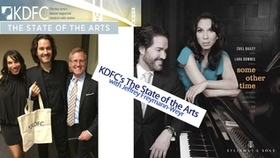 Tune in throughout the week for tracks from KDFC - San Francisco 'CD of the Week.' This week's pick is Some Other Time: American Classics for Cello and Piano from cellist ​Zuill Bailey and pianist Lara Downes. Downes and Bailey admit to a nostalgia for that period in American music when families gathered around their radios to hear the Saturday broadcasts from the Metropolitan Opera and around their TV sets to watch Leonard Bernstein's Young Peoples' Concerts. "It's not a world we grew up in, but it's a world we dearly want to see. ", says Downes. This new collection of transcriptions and concert pieces is a reflection of that "golden generation" with selections by Leonard Bernstein, Lukas Foss, Aaron Copland, and Samuel Barber. The CD title, "Some Other Time", refers to the wistful tune from Bernstein's On the Town which opens the disc.